The benefit of GoPro accessories kits is simple. Why do you think retailers buy goods in bulk? This is to ensure that they are considered price wise. That way they will manage to make a profit after selling them to the buyers. GoPro accessories kit applies that logic. Since you get to buy a collection of accessories all at once, they sell it to you for a fair price. The reason is not that you need to make a profit but to help you save money. It would be advisable to buy all accessories as a package. The chances are high that you will buy them at a lower price compared to if you purchased them one by one. Did you know that just as they say that you never know what you have until it is gone the truth, no doubt that even the fact that you never know you need it until you have it holds water? Enough said in the insight so let me take you through the best you should consider when buying. 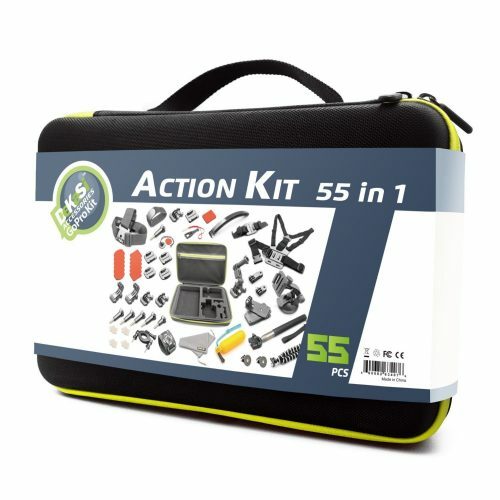 This is a kit with 40 accessories in it. 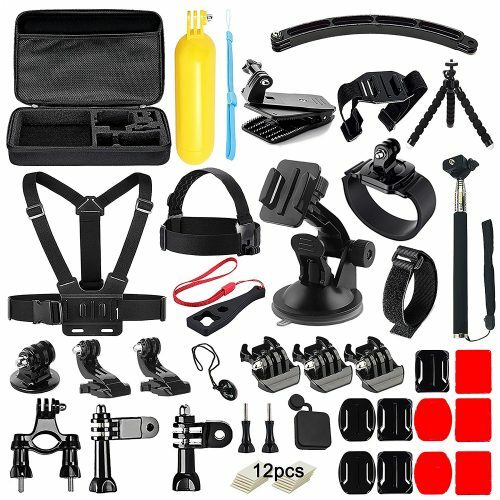 It contains all the accessories necessary for supporting your GoPro cameras. A chest harness strap belt is also provided to capture from the chest angle. Pieces are compatible with GoPro cameras. Can be used in cars, bicycles or autocycle. Perfect when skiing, riding, hiking, boating, and fishing. Also, has a swivel mount and windshield suction cup mount. If your devices fall under these categories, your search for GoPro accessories kit may have just come to an end. 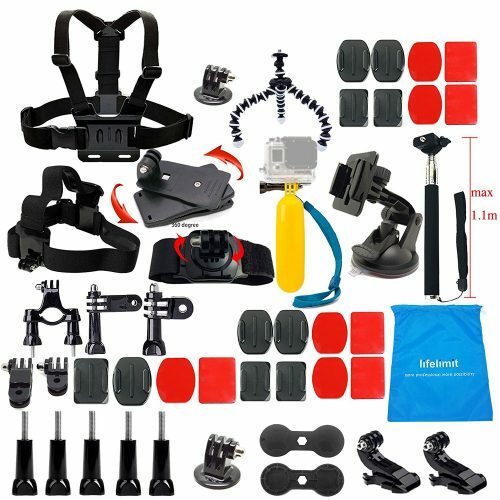 The gadgets include GoPro Hero 6/5/session5/3/2/1; GoPro Fusion; SJ4000/5000/6000; Akaso, Apenam, DBPower and Sony Sports DV among others. 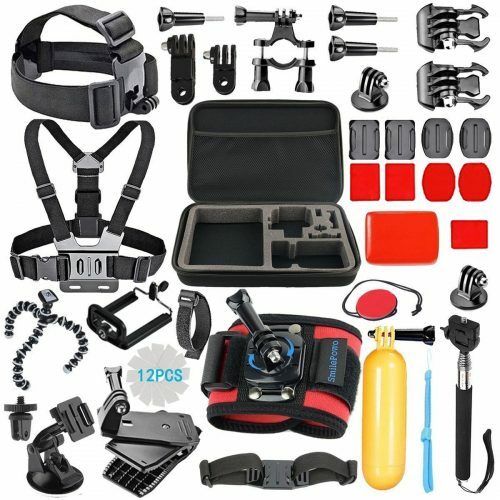 Comes with a chest strap for all GoPro cameras with Digital HERO 5 wrist camera excluded. It can be adjusted to fit the different sizes of various people. The adjustable head strap is compatible with all GoPro cameras. Wrist strap mounts only suitable for GoPro Hero cameras models. A multipurpose wrench to help tighten your screws. Perfect mounts when skiing, biking, kayaking and doing other action sports. Zookki brand has nailed it as far as Accessories kits are concerned. In this case, it has incorporated all that you need to use with your camera. Has a monopod handhold mount which can be shortened and elongated accordingly. Has a bike handler holder mount with a tripod mount adapter which is adjustable. A screw is used to securely and comfortably install mounts on your car, motorcycle or bike. Comes with a wrist strap mount as well. Dekasi is a famous brand not by default but based on the high-quality products that they sell. Its features cater to all the needs of a cameraman. Has a WiFi remote Velcro belt band wrist suitable for just the wrist or one covered with a dense This can be attached to bike handle, arm, wrist or steering wheel. When in the move, the shockproof carrying case protects your devices. 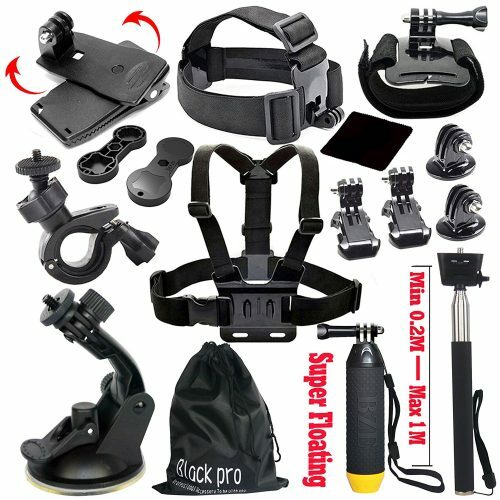 A comfortable and adjustable chest belt strap mount is one of the accessories of the kit. It is easy to either clip or removes. Has a monopod handhold mount and a tripod mount adapter. 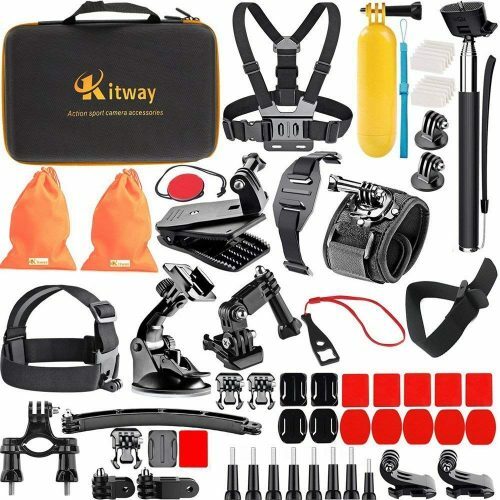 Kitway has a perfect one for those who get involved in high impact sports. They have got you covered in every aspect. A sizeable shockproof carry case envelops it to protect all your devices. Designed to cope with various terrains such as flying, backpacking, road trip, and fishing. An adjustable head strap which is compatible with all sizes of GoPro cameras. For chest fixation, a chest harness strap together with a j-hook buckle facilitates that. For use in water, you can buy a waterproof shell to be used with the given floating handle grip. That way it floats in water effortlessly. Spotting it in water because of being brightly colored is easy. The color, in this case, is yellow. Wrist holder mount can rotate up to 360 degrees and the same degree for the clip mount. This product has fifty accessories. It is ideal for low angle shots with the GoPro cameras. 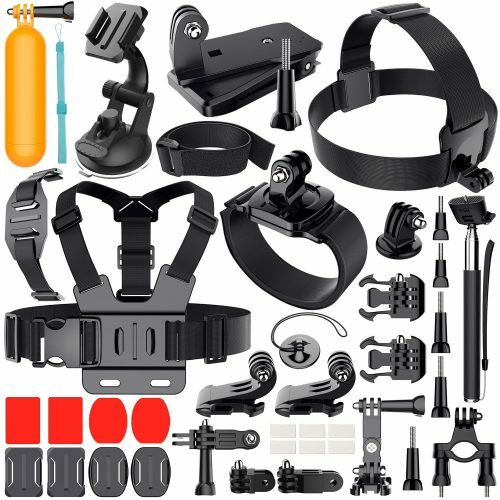 The GoPro accessories kit has various features which are highlighted below. Comes with a removable triangle suction cup mount. attached to either the arm, steering wheel, wrist or bike handle. compatible and easy to store. Suitable for web cameras, digital cameras, and camcorders. 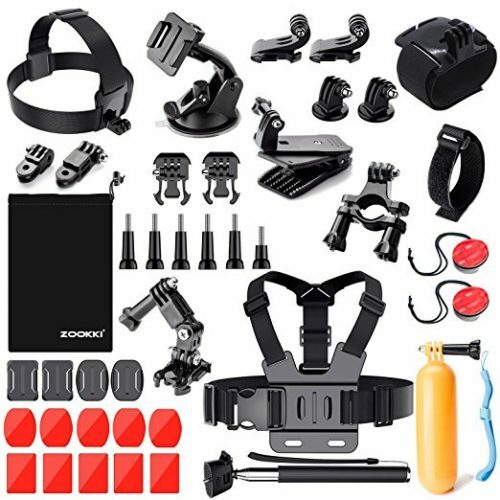 Soft Digits 50 in 1 Action Camera Accessories Kit is also a great GoPro accessories kit given the amazing features that make it alluring. Who wouldn’t like the best anyway? For the car window, the kit has a car suction cup mount which comes hand in hand with a vertical surface j-hook buckle. Also, an adjustable selfie stick monopod accompanied by a black tripod mount adapter for natural self-service photographs. In water, floating hand grip serves a great deal. 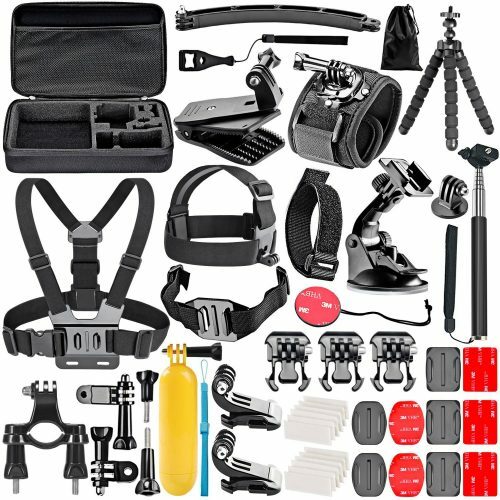 The GoPro accessories kit also contain a chest harness and a black buckle basic strap mount. There is a combination of every sport you may choose. Lifelimit Accessories Starter Kit is compatible with a wide range of devices. They include. GoPro Hero 5/Session/4/3/2/HD Original Black Silver Cameras. Other features are listed below. A chest strap suitable for all GoPro cameras and that is adjustable to whichever position you feel comfortable. The case is similar for the incorporated headband. Has a bicycle clip ideal for 19 to 35 mm in diameter. You can place it on chainstays, handlebars, fork legs as well as a seat post. Only the features of a product can help you know whether it matches your description and more so if it meets your requirement. This GoPro accessories kit is among the best considering its features. For the underground view, a floating handle grip and a floating block are things contained in this kit. If you are using a bike, there is a handler seat post holder which has a three-way adjustable pivot arm. A head strap and a chest harness strap for the different views. Its car suction cup mount is robust and comes with a pair of adapters. The size is relatively large. 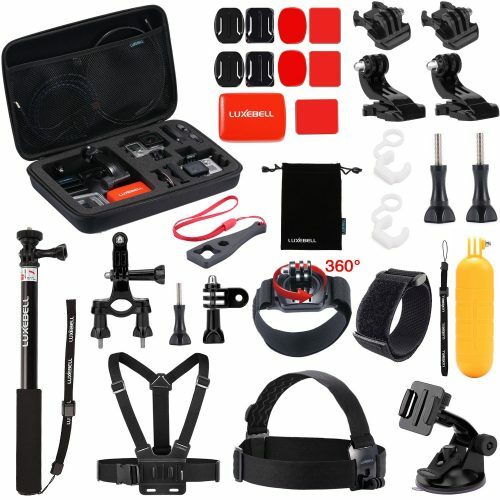 When you analyze bulkiness, this Luxebell GoPro accessories kit nails it all together. Almost everything seems to be in pairs if not more. A great idea could even be that of coming together with friends and buy it then sort yourselves out. Maximum protection from the large EVA shockproof carry case. Also, the foam padding to enhance the safety and simplify organization. A monopod is waterproof, extendable, compact and lightweight. Comes with chest harness strap belt, bike handler holder, and a head strap. Its adjustable wrist mount can be rotated up to 360 degrees. Enough has been said, and it is up to you to make that smart choice that will give your life a break. Ponder on what has been proposed above and buy that item which will meet your specific needs. GoPro accessories are a must-have for device owners.